Selecting the right two-way radio for your business is important. The features available can help ease your job and streamline your business. Before you can choose the correct radio to suit your needs, there are a few questions you need to ask yourself. 1- How many users and channels do you need? The number of users that will be operating on the radio system will help determine the number of channels necessary for your organization. For instance, if you have 5 people in maintenance and 12 in security you may want to have a maintenance channel and a security channel. If two of those users in security need to be able to speak privately then you can add a third channel as well. 2- What frequency band should you operate on? There are three different frequency bands that are commonly used for communications. VHF which stands for "Very High Frequency" 136-174 MHz is better suited for outdoor applications without much interference. These frequencies will communicate a further distance. UHF ("Ultra High Frequency") 403-512 MHz work better with indoor applications in which there may be some obstructions. The 800/900 MHz band is generally used for trunking two-way radio system. 3- What features are necessary for your organization? This can vary from safety features like intrinsically safe to telephone interconnect of even integrated data applications. Motorola has designed a spectacular radio selection guide to help you see what is available and what different terms mean. You can download this guide here. Also, don't be afraid to ask your local radio rep. 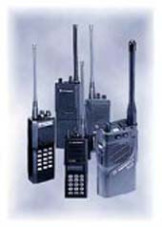 They are able to assist you in the selection of the proper radios for your operation. They will help you evaluate your needs and decide which frequency band, how many channels and what features are necessary for you to operate at peak performance.